Well… I haven’t posted anything for quite a while. I’ve been busy, to be sure, but not too busy to post anything. I guess I suffer from Attention Deficit Disorder on a large-scale. Forgive me if you were looking forward to hearing from me more often. I’ve mentioned before that I’m a missionary in Honduras, and although I don’t always write about that, it is the defining criteria in my life. Yesterday my wife brought a group of visiting church members from a church interested in what we are doing over to our house from House of Hope, where they are staying in the guest house. Although I had been very busy throughout the day, at the moment she walked in I was sitting at the computer trying a flash game online that my son was playing. I had literally walked in the door not five minutes before, but since I was checking emails when she left in the morning, and she returned to find me sitting at the computer playing a silly pirate ship game, to her I had probably been sitting here playing games all day. Add that to the fact that I hadn’t had any time to even make the bed or straighten up my mess and I can understand why she was miffed. Anyway, one of the young ladies she brought over was asking me about my blog and wanted to know if I ever update it. That, of course, made me feel guilty and so here I am, updating my blog. I think I’ll tell you what I’ve been up to for the past few months. I’d like to say that my time has been taken up with tirelessly walking from house to house, winning soul after soul to the kingdom of God. I’d love to tell you that, but I’d be lying if I did. Some of my time has been taken up with sharing the word of God. I have started a bible study/work program at the local prison. It’s called Fishers of Men, because if they attend the bible studies with me regularly they also have the privilege of using the materials, provided by a fellow minister from Alabama, for making fishing nets. These fishing nets can be sold for a nice amount of money locally to fisherman and the proceeds are to be split three ways. One third goes to Katrina’s craft store, Artesanías Esperanza, one-third to the prison for improvement projects and finally, one-third to the maker of the nets. It’s a good opportunity for some income for all three interested parties and the bible studies seem to be something they’ve been craving as well. We started with John 1:1 and we’ve gone through the first seven chapters so far. There are a lot of mistaken, legalistic doctrines and beliefs among the Christians in this area, and I’ve been using this opportunity to address some of those. Word upon word, precept upon precept, little bit by little bit. It’s a work in progress but I feel like the guys are really enjoying it. I’ll see if the Comandante of the prison will allow me to get some pictures of the guys and then I can post them here. 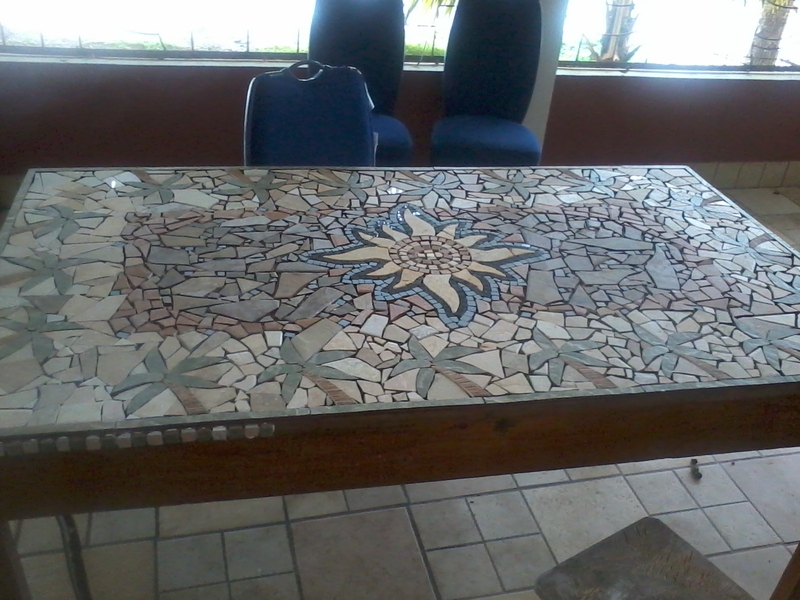 I’ve also been working on a mosaic table for our dining room. It’s actually the same old ugly pine table we were eating on before I started the mosaic project. I’m done gluing the tiles on the top and now I need to finish the lateral edges and I will grout it. I think the legs need to be sanded and oiled too. We’ll see about that. Here’s a picture of the (almost) finished product. So…those are two of the projects I’ve been working on in my absence of posts. What do you think? Should I start making more mosaics? Should I make them for my wife to sell at her craft store? It’s an idea I’ve had but I’m still mulling over the details. Roger I like your laid back writing style, its good to have you back. Beautiful table too!